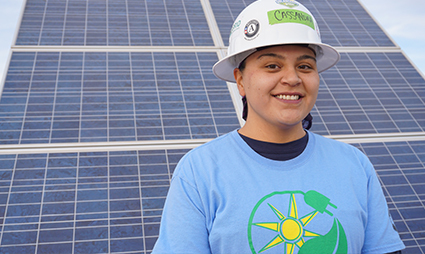 Cassandra Valandra is the newest Tribal SolarCorps Construction Fellow. Cassandra is a member of the Rosebud Sioux Tribe and is certified in Tribal Management from United Tribes Technical College. She also has small background in construction and is looking to broaden her horizons in solar. Her goals are to gain the knowledge and experience here at GRID and take it back to her Reservation to focus on creating affordable housing and job training opportunities for her people.